While on vacation with my children over the winter holidays I went grocery shopping at a supermarket in Santa Cruz, Ca. After ringing up all of my groceries the cashier asked me would I like bags for my items and of course I said yes. After all I had just purchased several hundred dollars worth of groceries, so I'm assuming I would need a bag or two. When she asked me how many, I told her however many it took to get them all in bags, duh! As I looked at my receipt on the way out of the door I noticed a surcharge of $.25 PER BAG added to my total. Are you kidding me??!!! Who charges money for bags? I was furious! Why wasn't I asked how many bags would I like to PURCHASE? As a visitor on vacation it should not be assumed that I know they charge for bags, let alone they never informed me before they charged me for the bags. $3 may not be a lot of money, but it was the principle of the matter. 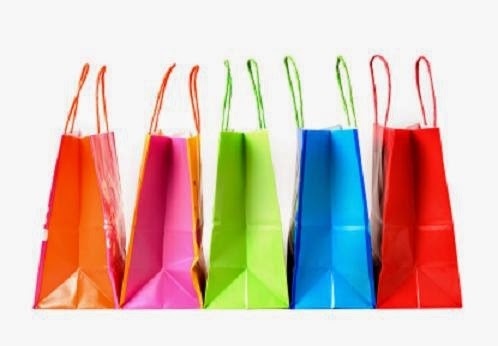 As the week went on we were out and about browsing in the boutiques and imagine my surprise when the cashier at the souvenir store asked me would I like a bag for the greeting cards that I purchased. You know me…the first thing out of my mouth was how much is this gonna cost. She informed me that it would be $.25 per bag. That means the big bag that I unknowingly purchased at the grocery store costs the same amount as this tiny little 5X7 bag that my greeting cards might be riding home in. To make mattes worse, I would have to purchase yet another bag to put my coffee mug in. Since I planned on framing the greeting cards upon my return home, I opted for the bag to protect them and I carried my coffee mug out of the store with no bag. Before returning home I decided to stop into a local surf shop and pick up a couple of sweatshirts. $175 later the cashier asked me would I like a bag and I in turn asked her was there a charge. When she said it was $.25 a bag, I tied one sweatshirt around my waist, and held the others as I walked down the street. This time I was mad. If I spend several hundred dollars in your store, the least you can do is absorb the cost of giving me a bag to carry my goods. I realize bags are filling up the landfills at an alarming rate and when I am home I do my part to cut down on my family's waste. I live in Contra Costa County and the stores in Richmond and El Cerrito charge money for bags. If I'm going to the grocery store I always bring my own reusable bags. HOWEVER when I go and purchase an $800 suit for my husband I feel the store should absorb the cost of the bag, or better yet throw in a garment bag for free. After all theses stores are not paying fees to the city for these bags, but they keep it for themselves. Since I live directly in the middle of 2 shopping malls I ALWAYS choose to shop at the one that does not charge me for bags. In a day where taxes and surcharges are being added on to our bills at every turn, bags are something that I refuse to pay for. I do keep a crate full a reusable shopping bags in my car at all times, but I refuse to use them for my clothing purchases and will continue to patronize the stores that value my business enough to include a shopping bag with my purchase. So what do you think? Does your city charge for shopping bags? Do you use reusable bags?